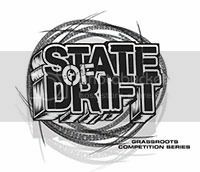 The State of Drift strives to further develop drivers beyond the street car stage. SoD will give drivers the ability to participate and grow in a competitive environment along with develope the skills and confidence needed to showcase live in front of a captive audience. Entry level drivers who have never participated in a competition will be guided and educated on how to promote themselves and sponsors while gaining the essential skill set needed for a Pro-Am series. SoD will provide drivers the guidelines for developing a vehicle suitable for a Pro-Am career, which meet FormulaDrift standards. 1st, 2nd, and 3rd place winners will be awarded prizes from all series contingency partners. NOTE: There is an additional $52 fee to register at the track on the day of the event. If you do not wish to compete, you may still enter to drift. Registration is only $75.